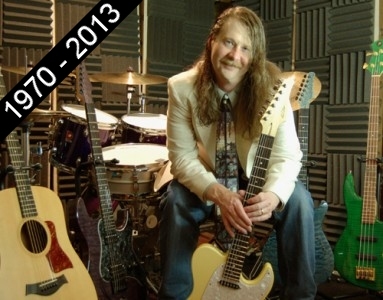 Today marks the fifth anniversary of the death of co-founder and guitarist Dave Kulju. Gino released a concept album (see below) that features a tribute piece to Dave, as well as a composition co-written by both & arranged by the band, which would have been included on Electrum's third album, which you can download for free. Given that this began as a file sent through email almost a decade ago, and that there was no way for me to do a proper mixdown, the end result isn't all that bad. It's a brief glimpse on the path we were headed on." Last band interview to ProgArchives.com - the ultimate source of progressive rock. Dave released his second solo CD Notes in the Margin in 2010. The album was well-received by the prog community and its reviewers, featuring the centerpiece 30 minute composition A Poet's Talespin, with guest vocalist Annie Oya. For more information, free mp3s of selected tracks, and to order CDs or mp3s, please visit DaveKMusic.com. Geomantia - Sixteen compositions exploring the dichotomy between design and chance by integrating aleatory music via geomantic devices, including: I Ching coins & hexagrams, dice, runes, and a tarot deck. Instrumental jazz/world fusion, with some elements of prog rock. It features Dave on two of the longest tracks, and includes two trilogies: the first based on sacred geometry, arranged in several odd time signatures, and the second in free time. More videos are available through the #GinoFoti Channel.